(AP) HAVANA - Cuban authorities detained a prominent dissident and dozens of her colleagues early Sunday, then rounded up more activists while they staged a weekly protest march through Havana. Police took away Bertha Soler and three dozen supporters of the Ladies in White dissident group hours before they were to take part in a regular march down Quinta Avenida in the leafy Miramar neighborhood of Havana. "They were arrested," said Angel Moya, Soler's husband and a former political prisoner himself. Soler was also detained briefly Saturday evening, he said. About 30 other Ladies supporters did make it to the march, which began peacefully, but state security agents moved in when the Ladies tried to extend the protest into streets they don't normally enter. All were escorted onto a bus belonging to state security. By Sunday evening, many had been released and some driven back to their homes, though Soler was apparently still being held. 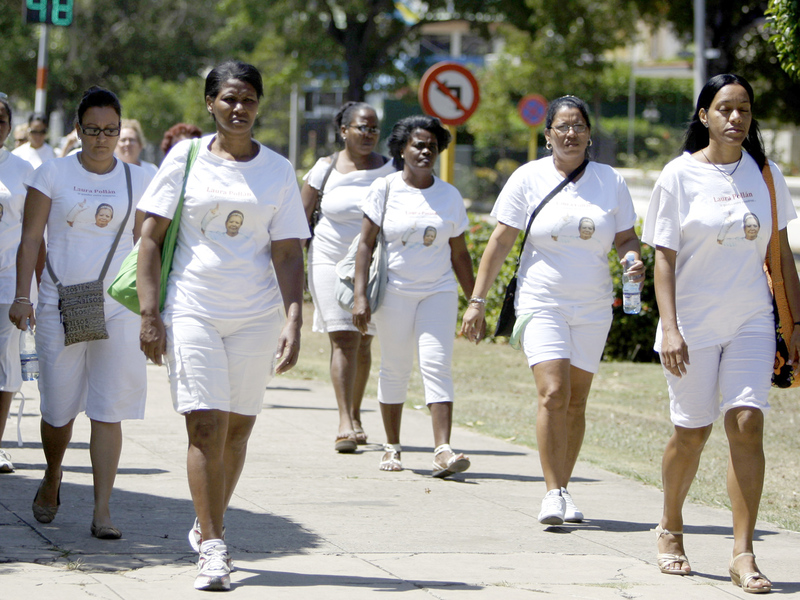 The Ladies in White formed in 2003, shortly after authorities jailed 75 intellectuals, activists and social commentators in a notorious crackdown on dissent, sentencing them to long prison terms. All have since been freed, and many have gone into exile. Cuba has cleared its jails of most political prisoners, but human rights groups say the government of President Raul Castro has stepped up short-term detentions and other forms of harassment against the island's tiny opposition. Cuba denies it holds any political prisoners, and says the dissidents are nothing more than common criminals and mercenaries paid by Washington to stir up trouble. It scoffs at criticism of its human rights record by the West, saying its Marxist system provides citizens with free health care and education, and many other subsidies, while capitalist countries are plagued by poverty. Sunday's detentions came just over a week before a March 26-28 visit by Pope Benedict XVI, who is likely to encourage the government to adopt increased religious, political and human rights during his tour, at least privately. It also comes days after Cuban Roman Catholic Cardinal Jaime Ortega asked police to remove a group of 13 opposition members who had occupied a church in Central Havana for two days. While many praise Ortega for mediating the release of political prisoners in 2010 and occasionally speaking out in favor of greater economic and political freedom on this Communist-run island, others say he has not done enough. They say Thursday's decision to call in police to remove dissidents from the Church of Charity demonstrates Ortega's lack of sympathy. Sunday's events will likely provide more fodder for those critics. "I can't get over my astonishment over what has happened in these last few days," Sanchez told The Associated Press. "The cardinal is acting like the first two of the three wise monkeys," who could neither see evil nor hear it. Even as members of the Ladies in White were being detained, Ortega was performing Mass at the grand Cathedral in Old Havana. His sermon inside the baroque, stone edifice before several hundred worshippers did not mention the week's drama, nor did he say anything about human rights in general. Instead, he kept his comments focused on religion and the pontiff's imminent arrival. "With a sense of gratitude, enjoyment and profound spiritual peace, and with the gifts that God has given us we prepare to receive the Pope," said the 75-year-old Ortega. "Let God grant us a truly warm reception for the Holy Father, and let his visit bear abundant fruit."